Back pain affects a great many people, and causes a lot of discomfort and distress. It can also result in lost earnings through lost days at work. There are lots of chairs and desks and other gadgets on the market designed to prevent or reduce back pain for people who spend a lot of time sitting at a desk, but these can be expensive. Much of the time, you can stop back pain recurring (or even prevented in the first place) simply by setting up existing desks and chairs correctly, and thinking about posture when sitting at a desk. Don’t hunch over the desk or keyboard, but don’t sit rigidly bolt upright – keep shoulders above hips and ears above shoulders. Don’t sit with crossed legs, as this affects circulation and twists the back. Sit right back in the chair seat and use the chair backrest for support. Adjust the chair seat height so that feet are flat on the floor and the elbows are just above the level of the desk, keeping them roughly at 90 degrees when typing or writing (if this means that the feet are no longer on the floor, try using a footrest, ideally one with adjustable height and tilt). If the desk is too low, try adjusting the desk height using blocks. Set up the chair seat to slope slightly forward so that the hips are higher than the knees, ideally keeping about a 135-degree angle between the back and thighs (if the chair seat angle won’t change, sit on a wedge-shaped cushion, or angle the chair backrest slightly back). Adjust the seat depth so that it’s about 2-4 fingers’ width away from the back of the knee. Set the chair backrest height so that it fits into and supports the lower back – if the chair backrest can’t be adjusted, use a cushion, lumbar roll (a firm, rolled shaped cushion, often with elastic or straps that can hold it in place on the chair backrest), or a folded or rolled towel. Make sure that chair arm rests don’t stop the chair getting close enough to the desk – if they do, remove them. The computer screen should be directly in front and about arm’s length away, and the top of the screen should be at eye level – if the height of the screen isn’t adjustable, try putting it (carefully and safely) on a pile of books. 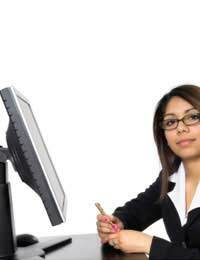 Use a separate monitor with a laptop when desk-based, or use a laptop stand to get the screen in the right place. Put the keyboard straight ahead, and keep the keyboard and mouse within easy reach. Keep shoulders relaxed and wrists straight when typing. Don’t tuck phones between ear and shoulder when typing or taking notes – use a headset or a hands-free phone. And Finally…don’t forget to get up and move around every hour or so.